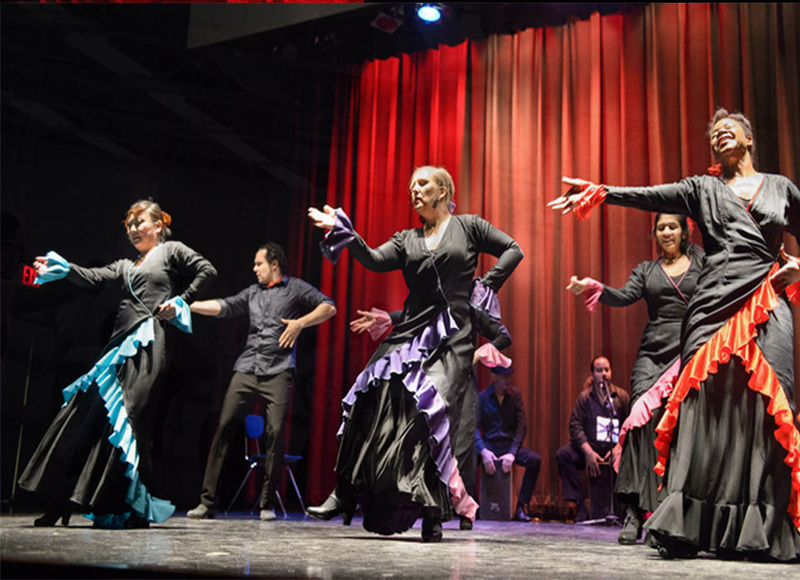 The Omayra Amaya Flamenco Dance Company is a nonprofit performing arts organization dedicated to the advancement and awareness of flamenco dance and music. We strive to increase understanding and appreciation for this dynamic Spanish art form through performances, education, and presence in communities around the world. What people have been saying! Omayra Amaya made a good case for big things coming in small packages. In a fiery tribute to her [great-]aunt, the acclaimed flamenco dancer Carmen Amaya, this dynamite performer was like a coiled spring, tightened and released at will with passion, flair and immaculate control. Amaya is extremely stylish, with a very aggressive flamenco style that works off angles–deep bends in the body, lightning turns with her head whipping back and forth, and legs that kick and hop off solid footwork. Through all this, the shoulders are loose, seductive, the arms supple, the hands expressive. She spent much of the work enticing singer Fernando de Malaga, ultimately luring him offstage with a final flourish of guitar and palmas (clapping) from her excellent musicians… Not only is full gypsy blood coursing through her veins, but the dynamic flamenco dancer has the heart (not to mention the phenomenal technique) of a born performer. As Friday nights wildly enthusiastic audience would attest, she is simply one of the best around, anywhere. The showís musicians are first-rate, especially the sensitive and accomplished guitarist Pedro Cortes and singer Fernando de Malaga, who wraps his husky warble around each melody with a raw urgency that seems to pierce the movement’s core. Amaya summoned much of her magic through powerful braceo (arm movements) and explosive footwork that wasn’t just about stamping: She used her heels and toes as much as the balls of her feet. I dare anyone to take his or her eyes off Omayra Amaya when she’s performing the flamenco she was born to dance. The Gypsy heritage singing in her bones and sinews and the self-awareness that flows out of her performance is a rarity, a meeting of tradition and stubborn individualism that is thrilling to behold. She seems less a performer than a force of nature Her commitment to exploring jazz as a new ìcolorî to add to flamenco extends to the way the dancers of the company gather in a phalanx, twisting their wrists above colorful cuffs, idiosyncratic flamenco rhythms, and the brisk ways they turn their heads this way and that. Amaya dazzled her audience with impeccable timing, total control, a fine sense of line, and an openness to experiment. Amayaís dancing is powerful, emotional, earthy and graceful. As is the dance itself. Her finest quality, however, is something less purely visible. It is her use of energy and the skill to use as she pleases. When on stage, she owns it. But then there was Omayra Amaya, herself a relative of the legendary Carmen Amaya, whose command of the stage is devastatingly direct and effective… Amaya gave an amazing Solea por Bulerias, a dance of sudden fury and startling silences. How she would put our as much energy as she did and not be breathing heavily at the end of it is beyond me, but such was the ease. This is some of the best flamenco you will ever get in Denver. A master of both sustained tension and fast-shifting moods, she commands the stage and makes the audience her hostage, whether marching like a filly in dress parade or suggesting a bull-like ferocity. © 1994-2019 Omayra Amaya Flamenco Dance Company. All rights reserved. Omayra Amaya Flamenco Dance Company is a non-profit performing arts organization dedicated to the education and awareness of Flamenco Arts.